I guess this is the ultimate alterations day...making things that are meant for one purpose look like something else. From using a bed sheet for a ghost to making a cape from a bath towel, Halloween is the best time to spark your creativity. If you don't have a costume yet, go check your closets and drawers. Find something unique and make it into something else. 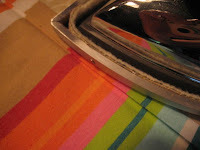 Look around at common household items and re-purpose something. Open your mind and do something no one on the block has the nerve to try! It's easy to save money doing alterations on your home decorator items. Shortening straight curtains or a tablecloth is a simple process that will give your room a custom made look, because these accessories will now actually fit your windows or furniture. 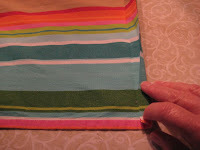 Today I will show the steps to shortening a tablecloth. 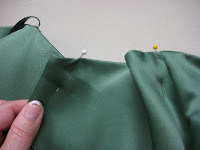 You can use these photos to help you shorten any straight edged piece of cloth, including window curtains, valances, bed skirts. If you're nervous about tackling this, start simple, with an old sheet or dishtowel. 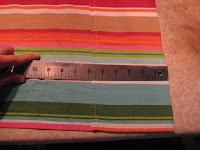 The first thing I do is mark the new hemline, then fold this amount on the curtain, wrong sides together. In this example, the customer has requested I shorten this curtain 5¾". 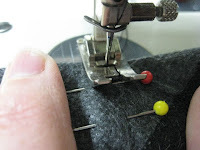 Press this new hem into place. My rule of thumb is to put things back the way I found them! 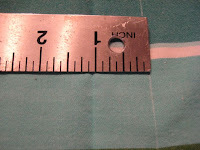 So here, I measure the existing hem so that I can put the new hem in exactly as I see the old one. In this case it is ½" deep. I often take pictures to help me remember. 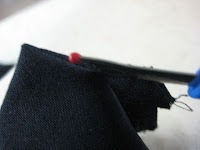 Now I have opened the curtain back up and I use wax chalk to mark the hem allowance. This is usually the amount of hem showing (see previous picture) times two. In this case, it is ½" x 2 for a total of 1". 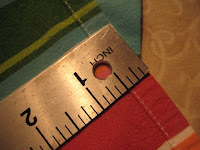 Time to fold this new 1" hem allowance in half. I just bring the cut edge up to meet the pressed line. Well, if you're thinking this process is a lot more time at the ironing board than at the sewing machine, you're on the right track. 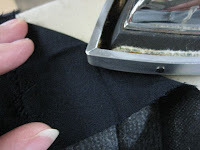 I press again, this time folding the hem allowance up twice, on each of the pressed lines I have already creased, making a "double thick" hem. Time to stitch close to the fold, and I'm finished! Today I altered a gown for a bridesmaid who has recently delivered a baby. She bought a dress that was big throughout the belly area, so we had to take in the bust. It was gaping open so badly that you could see right down into it. First, I had to pin out the amount to be taken in. 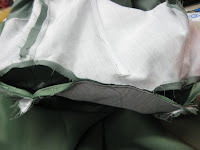 Since it was such a large amount, I decide to take it out of four seams, 2 bust and 2 side seams. 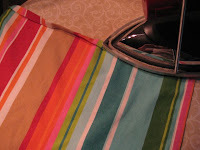 Next, I separated the lining from the fashion fabric. 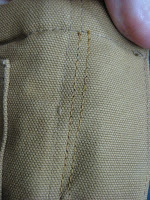 This involved removing the stitching as well as the understitching. 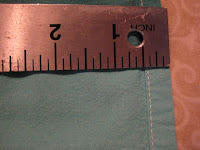 Since the dress had boning in it, as any well made formal will, I removed the stitching that attached it to the seam allowance. In some dresses, it is attached to the lining, but not here. I then took in the side (or bust) seam, graduating the new seam into the path of the existing one, making sure to keep a gentle angle. 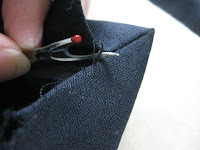 If you take in a lot, in a short amount of length, your garment will be pointy at the seam. 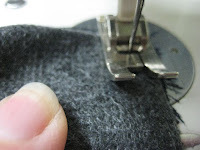 After that, trim the seam allowance and press the seam open. 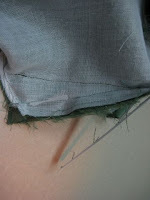 Then reattach the boning to the seam allowance. Now I repeat all these steps with the lining. 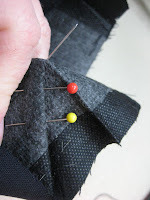 The next part requires a little creativity, especially if you have taken a lot of the seam in, as shown here. I have to stitch the neckline back together, but the new edge is uneven, because of the newly stitched seam. You could draw a new stitching line with chalk or a disappearing marker, but I just eyeball it. Just make sure all the layes are caught in your stitches. Sometimes you can't see this until you turn it right side out. 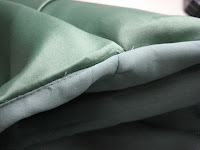 The finished seam should look like this. Rip and redo if you have to, to get a smooth line. Now I can add understitching that will meet the understitching that remains. Time to press well. 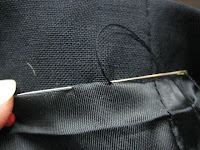 The finished garment should lie smooth and fitted against the chest area. 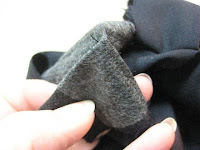 Today I have been asked to talk about shortening a sleeve that is lined and has a vent. 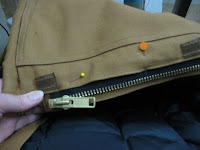 I hate to say it, but this is the most time consuming alteration I do, with the exception, of course, of that Carhartt jacket from the previous post. I always start by examining the existing sleeve. 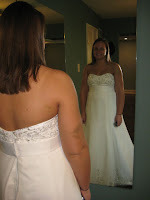 I have a rule of thumb to put a garment back the way I found it. This is easier when it comes to sleeves, because you can alter one while the other one stays in tact. 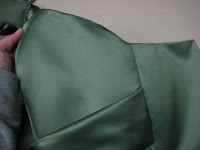 These sleeves have a mitered edge, which is toughest to do, but once you get the hang of it, it is still the toughest to do! 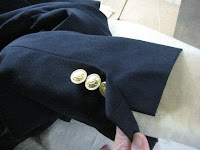 First, I removed the buttons and ripped the lining from the fabric. 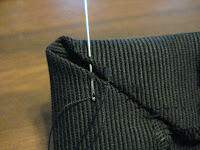 I now rip both sides of the sleeve vent, to open up the whole hem. 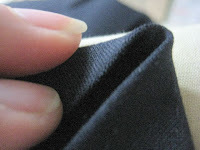 Then I can mark the hem, fold it up, then press it into place. 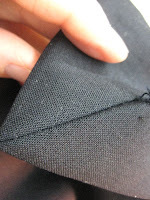 The bottom side is easy enough to seam at the end. 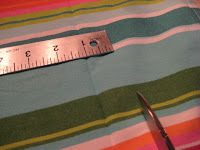 Just fold the new hem allowance back on itself (right sides together) and stitch the edge. The top edge is mitered, so I have to create a new miter using the iron. Here are some pictures to illustrate. The first picture is the bottom side, the next two are the top edge. 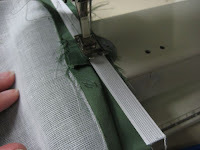 Using the lines that are now pressed into the vent, sew a diagonal seam that will line up with the vent bottom. Turn this right side out and you have a finished miter. It's actually better to do the underside last, so you can adjust it to match the new length of the mitered side. 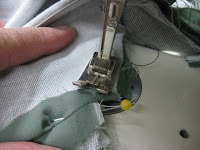 Once the two edges of the vent are complete, you need to shorten the lining by pressing it up, then handstitch it into place. Attach the buttons and you are finished. 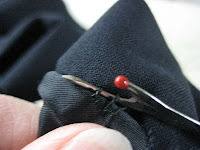 Tomorrow's post will be an easier alteration, maybe one that many of you find yourself doing. Leave a message in the comments below or write to me on my Contact Me page if you have something specific you'd like me to write about. I finally finished that Carharrt Alteration! Each side of the jacket is different. 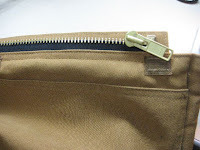 As you can see in the finished product photo, the right side has a wind flap beneath the zipper and the left side has it over the top. 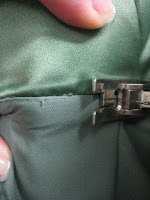 In this jacket, the left side is easier to sew. Since the two layers are still attached, I merely sandwiched the new zipper between those, then stitched very close to the edge. I went back and stitched again, about ¼" to the left. The right side is a little trickier. 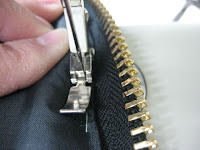 I aligned the zipper tape with the edge of the lining and basted. 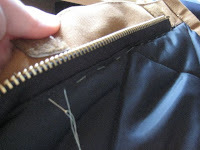 Then I stitched close to the edge, moving that flap out of the way so as to only catch the zipper tape and the lining. 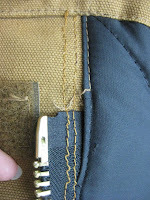 Then I topstitched with jean thread, double stitching on the front of the coat. This created a slightly off line stitching on the underside, which will never be noticed. 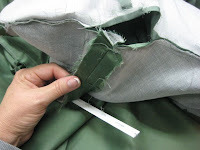 Sometimes this requires some rip and redo, because you are trying to get good looking stitching on the outside, while catching all the layers on the inside. All in all, the project turned out very well, and I was really proud of my work. When I get another one of these to work on, though, I will charge more than I do for a regular jacket zipper, because it was very labor intensive! Well, I can't believe it's been 6 months since I've posted. Life has been busy to say the least. 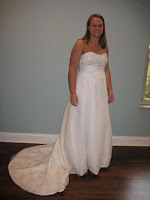 The main project I have worked on in that time span has been our daughter's wedding gown. I started in June and finished last month. Above are a few pictures. It was by far the longest and most involved project I've ever taken on, and I loved every minute. I took a couple of online classes from and did a lot of research. 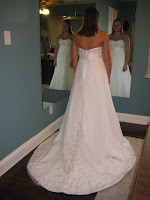 The fabrics and laces and beads we picked were really wonderful and the whole thing was a great success. 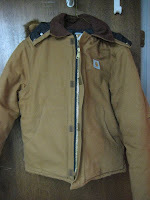 Tomorrow I will write about the steps I took to finish the Carhartt jacket and then, on with the next alteration. I have lots of pictures saved from work I've been doing in the past 6 months, so I'm happy to share. Please stop back!